On a night dive in the Philippines several years ago, I had an opportunity to do a "fluoro" night dive. Atlantis Dive Resort rented blue underwater flashlights and yellow filter shields that went over divers' masks. Geared up, I set off into the night. The blue light was very dim and the dive was much darker than a normal night dive. After a few moments of wondering what exactly I was doing underwater in the blackness of night, my eyes started to adjust and the first fluorescent colors started to show up. I suddenly felt like I was in a neon video game with the underwater world transforming into vibrant greens, reds and yellows. A bright, glowing light snaked across the sand, and on closer inspection, it was an eel that was vivid green. Later in the dive, I saw the outline of a red fish in the sand. It turned out to be a scorpionfish with only the outline of its body glowing reddish-pink while its lacy appendages along its body did not. Hard corals, which during the day were a bland ivory color, were now dazzling green and yellow, with tinges of maroon. The ocean as I knew it was suddenly changed, and I could not wait to come back with a camera and start capturing these amazing, unexpected colors. Fluorescence is a process wherein light is absorbed as one wavelength or color and then emitted as another. 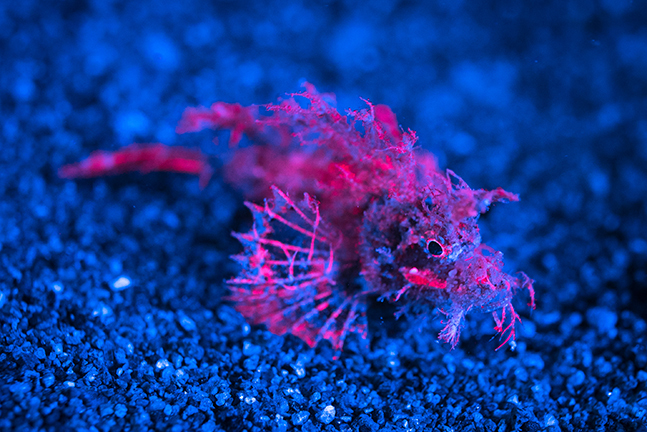 Examples of this have been seen in nature, particularly in the ocean, but the easiest example of it is the use of a blacklight, or ultraviolet light. Shining this light reveals colors not seen with other lights. 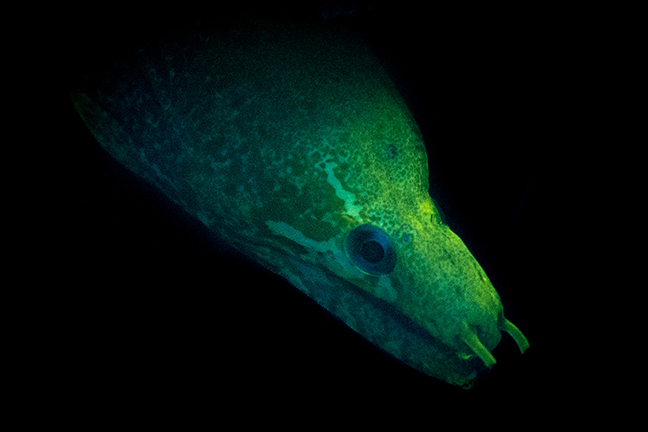 An eel seen under normal light may be brown, but under a blue light, day-glow green can be seen. 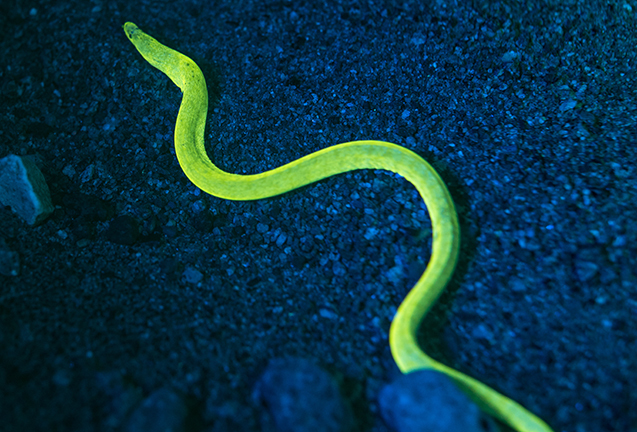 Various creatures have been documented to fluoresce. Some of the most common include hard corals and anemones, but divers have also shown fish, seahorses, nudibranchs, fireworms, sea turtles and even sharks fluorescing. What is interesting is that individuals of the same species may not all fluoresce, you may see one octopus glowing green and red, but not another. 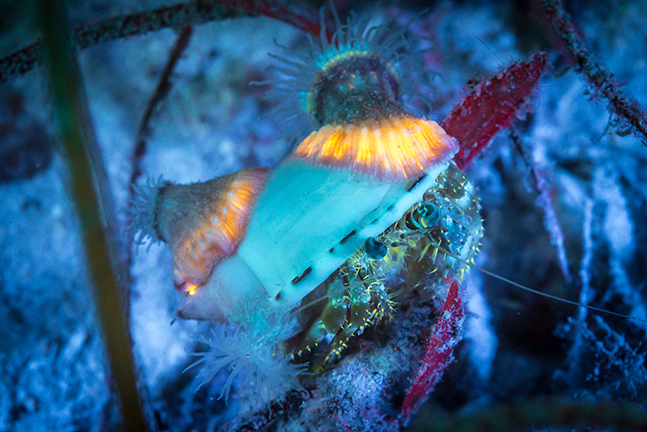 Sometimes even with coral of the same species, side-by-side, only one of the two individuals will fluoresce. 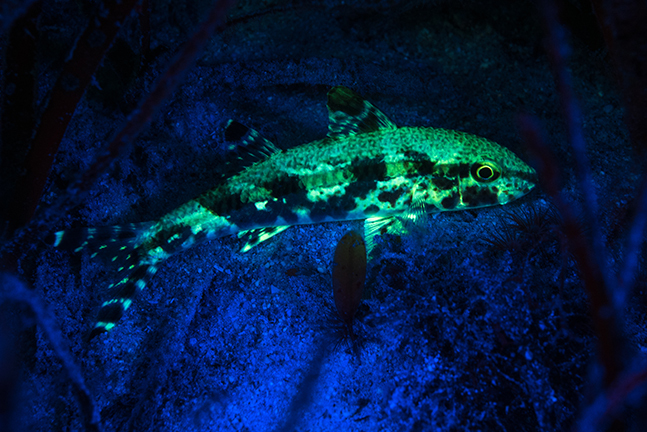 There is still much to learn about fluorescence in the ocean. Scientists have some suggestions of what might be happening, including fluorescence being a means of communication, used for reproduction, or even as sun protection. But keep in mind that fluorescence is different than bioluminescence. Bioluminescent organisms—such as fireflies, jellyfish and dinoflagellates—produce energy to make their own light; these are organisms that divers see on night dives, which light up in the water column when we kick our fins or wave our arms. Fluorescence, on the other hand, is when the electromagnetic radiation of one wavelength is absorbed and the light of another wavelength is emitted. To get technical, a photon from our light source (UV or blue light) strikes a protein (i.e. green fluorescent protein in the cells of an organism), which absorbs the light energy. This energy causes electrons to jump to a higher electron shell and it becomes unstable. To return to stability, it quickly returns to the lowest energy state, and the release of energy may be as a new photon of light (in our case, perhaps, neon green). A small amount of energy is lost in this process, so the photon going in has less energy than the one coming out, and less energy means a longer wavelength of light (different color). Basically, one light color goes in and comes out as another. Recently researchers have found that some fish species have eyes with yellowish lenses and cornea that may help them see fluorescence (similar to the mask barriers we use). 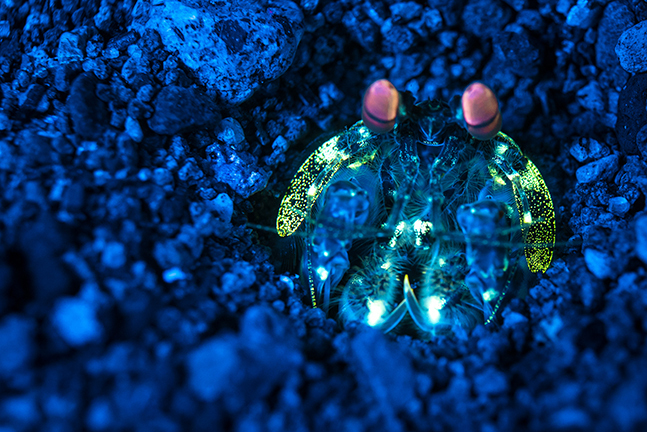 This helps support the hypothesis that fluorescence is important in the marine world. Fluoro dives are always an adventure, and it is exciting to see marine organisms in a new light. Divers can also contribute by being citizen scientists. While research is ongoing, divers’ photographs can (and have) shown new organisms fluorescing that had not been seen before. Fluoro dives and photography require specialized equipment. For divers, special UV or blue lights are needed, which are the right wavelength for exciting the electrons and triggering fluorescence. Divers must then wear a barrier mask or shield (usually yellow) which filters out the blue light, revealing the fluorescence (otherwise, we would just see blue). Some companies make blue or UV lights, and others make filters that go over a normal light. Barrier shields are usually worn like glasses over a mask. Blue light is far more popular with divers than UV, because UV has the potential to cause harm if accidentally directed into other divers’ eyes. Taking photos of fluorescence requires a camera to have the same items. The lights or strobes of the camera must be outfitted with UV or blue light capabilities, and the camera lens port (like the diver’s eyes) must be covered with a barrier filter. I use Ikelite’s dichroic excitation filters and yellow barrier filters, which easily attach and detach over strobes and ports. They are wet-mounted, so can be removed to do normal photography on the same dive. Capturing fluorescence underwater is not easy. Low-light situations and lack of contrast make it difficult for cameras to focus. The brighter the blue light, the easier the camera will focus, and more light will allow for a smaller aperture to get the desired depth of field. It is easy in these low-light situations to use a wide aperture and slow shutter speed to let in the most amount of light, but then the photos are often blurry. Increasing the ISO can help, but depending on the camera’s capabilities, high ISO may introduce noise and reduce the photo quality. It is possible to capture fluorescence during the day, but very bright lights are necessary, so it is generally easier at night. UV or blue lights are considerably dimmer than normal night diving lights. It is very important to have a backup white light, or to have a UV or blue light that can either switch to a normal white beam or a filter that can be easily removed. While underwater, it can be difficult to see parts of the reef or objects underwater that do not fluoresce, as they will appear black and may be hazardous for divers. Brandi Mueller is a PADI IDC Staff Instructor and boat captain living in Micronesia. When she’s not teaching scuba or driving boats, she’s most happy traveling and being underwater with a camera. For more information, visit: Brandiunderwater.com.